Born and raised in Calgary, Alberta, Mark is the youngest son of Nick and his wife Joan. He played football for the University of Calgary Dinos and the University of British Columbia Thunderbirds, and won Vanier cups with both schools in 1983 and 1986. Mark married his wife Michelle in 1989 and together they raised three children: Ben, Saige, and Annie. Mark has never had a job other than working at Nick’s Steakhouse & Pizza, and bought the family business from his parents in 2000. Born in the small village of Kardiakafti, Greece, Nick came to Canada at the age of 17 leaving his parents, five brothers, and three sisters behind. Though he had no money in his pockets and spoke no English upon his arrival, Nick worked numerous jobs ranging from janitor to dishwasher, busboy, waiter, maitre’d, and even manager. He married his wife Joan in 1959 and together they raised three beautiful children: Kim, Tim, and Mark. 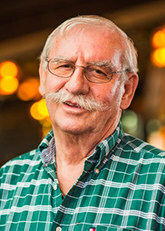 Nick spent decades in the restaurant industry before he founded Nick’s Steakhouse & Pizza in 1979. Chef Anthony knows steak. As a born and raised Calgarian, he’s been grilling steak since before he could walk. 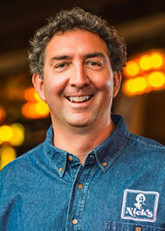 Throughout his career, all of which has been spent serving Cowtown, Anthony has perfected the art and science of the sear, as well as the love of his craft that he pours into every meal he prepares. Anthony and his wife, Vicky, dedicate and share their lives with their three children. 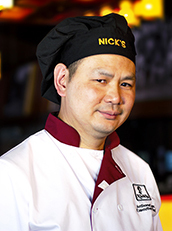 We are always looking for talented, dedicated, and enthusiastic individuals to join the Nick’s family! Please send your resume and cover letter to nickssteakhouse@gmail.com to apply.